Most inexpensive and medium-priced watches used mainly for timekeeping are electronic watches with quartz movements. Expensive, collectible watches valued more for their workmanship and aesthetic appeal than for simple timekeeping, often have purely mechanical movements and are powered by springs, even though mechanical movements are less accurate than more affordable quartz movements. Before the inexpensive miniaturization that became possible in the 20th century, most watches were pocket watches, which often had covers and were carried in a pocket and attached to a watch chain or watch fob. Watches evolved in the 1600s from spring powered clocks, which appeared in the 1400s. Wristwatches are often appreciated as jewellery or as collectible works of art rather than just as timepieces. This has created several different markets for wristwatches, ranging from very inexpensive but accurate watches (intended for no other purpose than telling the correct time) to extremely expensive watches that serve mainly as personal adornment or as examples of high achievement in miniaturization and precision mechanical engineering. Traditionally, men’s dress watches appropriate for informal, semi-formal, and formal attire are gold, thin, simple, and plain, but recent conflation of dressiness and high price has led to a belief among some that expensive rugged, complicated, or sports watches are also dressy because of their high cost. Some dress watches have a cabochon on the crown and many women’s dress watches have faceted gemstones on the face, bezel, or bracelet. Some are totally made out of facetted sapphire (corundum). 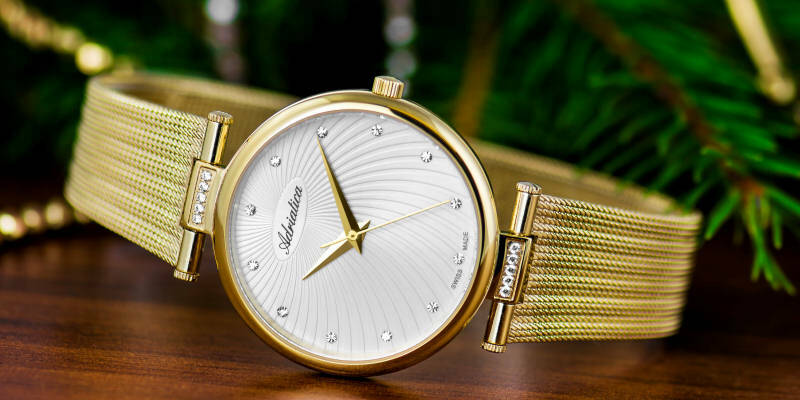 Many fashion and department stores offer a variety of less-expensive, trendy, “costume” watches (usually for women), many of which are similar in quality to basic quartz timepieces but which feature bolder designs. In the 1980s, the Swiss Swatch company hired graphic designers to redesign a new annual collection of non-repairable watches.